Kid Governor® – An award-winning statewide civics program created by the Connecticut Democracy Center. Kid Governor® is an award winning civics education program for 5th graders created by the Connecticut Democracy Center, formerly the Connecticut Public Affairs Network, in 2015. 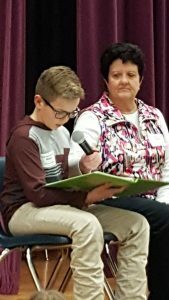 Students who participate in the program have the opportunity to create a campaign platform around a community issue they want to see changed, run for office, and vote in an election for their state’s Kid Governor. Kid Governors hold their office for a one year term, giving them time to make a significant impact in their states and communities around the issue they’ve selected. Want to bring Kid Governor® to your state? Click HERE! Meet the 2019 Kid Governors! Watch Ella’s Campaign Video HERE. To learn more about Connecticut’s Kid Governor, visit CT.KidGovernor.org. Watch Lola’s Campaign Video HERE. To learn more about New Hampshire’s Kid Governor, visit NH.KidGovernor.org. Watch Erikka’s Campaign Video HERE. To learn more about Oregon’s Kid Governor, visit OR.KidGovernor.org. Published: 2018 Oregon’s Kid Governor Dom Peters releases Pippin and the Super Kind Friends Club! ORKG Dom reads his book on kindness to students at Prairie Mountain School. As a part of his anti-bullying platform, 2018 ORKG Dom Peters wanted to write a book to share with the students of his state. With the help of his classmates, Peters wrote Pippin and the Super Kind Friends Club to inspire others to be kinder to one another. The book is now available on Amazon to add to your personal or classroom library! Look for the Kid Governor Library coming soon! 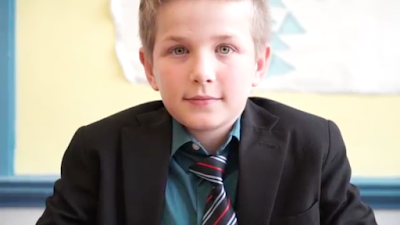 Learn more about 2018 Oregon’s Kid Governor Dom Peters HERE. 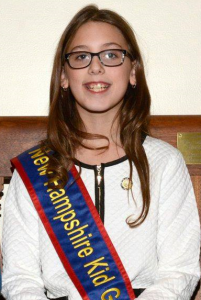 During her year-long term as 2018 Connecticut’s Kid Governor, Megan Kasperowski worked on her Stronger Than Cancer platform. Last spring, she launched her Stronger Than Cancer fundraiser to help hire entertainers to visit hospitals in Connecticut to cheer up patients. Thanks to the help of students and community members, CTKG Megan was able to raise over $4,300 to lift the spirits and change the lives of children with cancer! CTKG Megan donated $1,250 each to both Connecticut Children’s Medical Center in Hartford and Yale New Haven Children’s Hospital in New Haven. The remaining funds were donated to pediatric cancer research being done at Connecticut Children’s Medical Center. 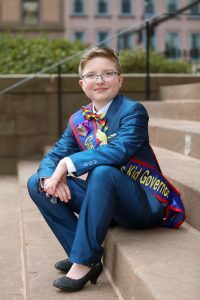 Dom Peters of Brooks, Oregon was elected as the first-ever Oregon’s Kid Governor (ORKG) in November 2017. He spent 2018 making a difference on his anti-bullying platform, including writing a book on kindness. Dom’s book, Pippin and the Super Kind Friends Club, was illustrated by one of Dom’s classmates. As ORKG, Dom did several public reading of his book, including a stop at the Oregon State Fair. Dom also starred in an educational civics video alongside the Governor, Treasurer, and Secretary of State. You can watch Dom’s video HERE, and you can learn more about his term as 2018 ORKG on his blog, The Kindness Project. Kid Governor® is a national award-winning statewide civics program created by the Connecticut Democracy Center (CTDC), formerly the Connecticut Public Affairs Network (CPAN). Kid Governor is presented in partnership with the National Association of Secretaries of State and the Connecticut Council for the Social Studies.